Many young people I meet these days hold economic views that are pro-market and entrepreneurial. They also believe in social tolerance, and wonder where that places them politically. Are they Republicans? Democrats? There is a wonderful tool called the Nolan Chart that we could all use to more accurately represent our political positions, and ease the current divisiveness that plagues our nation. Instead of the traditional "left-right" line, which measures politics along a one-dimensional line, the Nolan Chart represents a much richer variety of political viewpoints. I was there the day this breakthrough was first envisioned by legendary '60s-era youth leader Carl Oglesby. It was October 10, 1965, at the Unitarian Church in Ann Arbor, Michigan. Carl Oglesby, 30, was the elected leader of the Students for a Democratic Society (SDS). I was his teenage expert in marketing the anti-Vietnam War movement to my peers -- people under 18. Carl was preparing to give a talk at what was going to be a massive anti-war demonstration in Washington, D.C. on November 27 -- although we didn't know at the time that the turnout would be so huge. He had written his soon-to-be-historic speech, "Let Us Shape the Future," and was practicing it in the church rec room. I was only 13, and was president of the Unitarian Church youth groups in both Ann Arbor and Flint. Needless to say, I worshipped Carl. After the service, we all gathered for coffee, eager to hear Carl's speech. As we listened, we noticed that Carl used the word "coordinates" to describe issues on which he believed the Left and the Right shared common ground. This led us into a discussion of the limitations of the Left/Right line chart, which was often used at the time to illustrate a person's political views. Left (liberal) to Right (conservative). The assumption was that people on the Right were more focused on economic freedom (and less concerned with personal freedom) and those on the Left were more concerned with personal freedom (and less concerned with economic freedom). Carl was trying to explain in his speech that plotting our political ideologies in this limited way had created a false Left/Right dichotomy that made Democratic and Republican viewpoints seem hopelessly at odds. My father understood what Carl was getting at but felt he needed a better way to explain it. Knowing my love for math, he asked me to diagram Carl's concept on the chalkboard in the coffee room. Eager to show off, I grabbed a piece of chalk and drew an X and a Y axis. 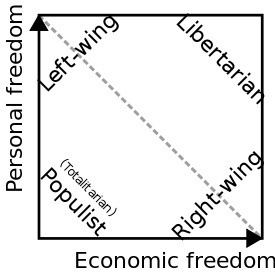 I labeled the horizontal axis "Economic Freedom" and the vertical axis "Personal Freedom." Essentially, this is what I drew based on Carl's insights. This groundbreaking diagram was eventually christened the Nolan Chart for David Nolan, who came up with the word "Libertarian" to describe people whose political views fell into the chart's upper-right quadrant. The Nolan Chart opens up the political landscape, prompting people to rethink their assumptions. Using the old Left/Right line chart, for example, it is hard to say whether Ron Paul or George W. Bush is more "conservative," but on the Nolan Chart, both their views can be plotted clearly. In 1972, I presented the idea of a three-dimensional "cube" chart to Nolan and economist Murray Rothbard -- another early Libertarian theorist. My "Mariotti Chart" cube added ranges for legality and morality. Although they loved the Mariotti Chart, we ultimately decided it was too complicated for widespread use. The Nolan Chart, meanwhile, became the defining document of the Libertarian party, which Nolan founded in December of 1971, using ideas developed by Carl Oglesby, Murray Rothbard, Ayn Rand and F.A. Hayek. Nolan published his initial version of the chart in his article "Classifying and Analyzing Politico-Economic Systems" in the January 1971 issue of The Individualist, the monthly magazine of the Society for Individual Liberty (SIL). David and I were great friends, and he often asked me whether I would like credit for the chart. I declined, because he had done the work to develop the chart further and had had the courage to incorporate the Libertarian party. In my opinion, the Nolan Chart is one of the most important political breakthroughs of all time. It allows people to articulate and represent their political views clearly, and helps us all find common ground. People with differing views regarding how the law should govern an individual's actions, for example, might realize that they hold common economic views, for example. The Nolan Chart makes it easier to express political concepts such as classical liberalism -- which emphasizes securing the freedom of the individual by limiting the power of government, or voluntary society -- in which all services are provided through voluntary means, such as private or cooperative ownership, rather than state ownership. Carl Oglesby was eventually fired as head of the SDS, as the movement became radicalized and co-opted by the Weather Underground -- a topic I plan to write about at length in future articles. His speech in front of over 35,000 people on the Washington Mall remains one of the most significant of the 1960s, however. It galvanized young leaders to join the anti-war movement and it also emphasized the potential of free markets and entrepreneurship. I trace my vision for founding the Network for Teaching Entrepreneurship (NFTE) back to that day and that powerful speech by my first mentor. I believed then, and I do now, that we can shape the futures of thousands of low-income, at-risk youth through entrepreneurship education, and economic and personal freedom. CORRECTION: An earlier version of this post indicated that Oglesby spoke at an anti-war demonstration on November 22, 1965. The demonstration took place on November 27, 1965.